For the special occasions or simply for the adornment of the dining room, a dining table set has to be A-perfect and eye-pleasing! The round dining table set in the genre of the dining table sets is the tricky one when it comes to embellishing it with different entities. Because of the compact size, it becomes a mind-numbing to select the things that can be used to place on the round table. These units should be small, effective and beautiful, for adorning the round dining table set. So, if you are a proud owner of the beneficial round dining set, but it is lying monotonously in the corner of the room. Then, it is the right time to take it out and follow the below-mentioned points to get the decoration on point! Whether you have a classic country style dining room decor or traditional rich decor theme, these points will help you have the oomph factor at the top! The best way to make the decoration of the round dining table set captivating is to work according to the seasons. For summers, bring out the pops of calm, cooling colours like green, and the tones of blues, etc., this will bring a summery effect in the room. Include the round dining set cover and chair covers in these mentioned colours. For winters, go for wine, reds, and dark cherry colored covers that reflects a bold and beautiful look to the room. Make sure you take the room’s decor along with the decor of the dining table to create a unified and refined appeal. If you are holding a formal party in the home. Then, adorn the round dining set with the warm on-trend gold accessories and add a big bouquet of red roses in the middle of the table. For more significant effect, add fine gold flatware and delicate, pretty glasses for an elegant and gorgeous effect. If you are not the loud and party kind of person, then layer your beautiful wooden traditional round dining table with white linen or light peach coloured covering to get a minimalistic look. So, get rid of the bright tones, and include subtle and elegant ones to create a striking dining room. 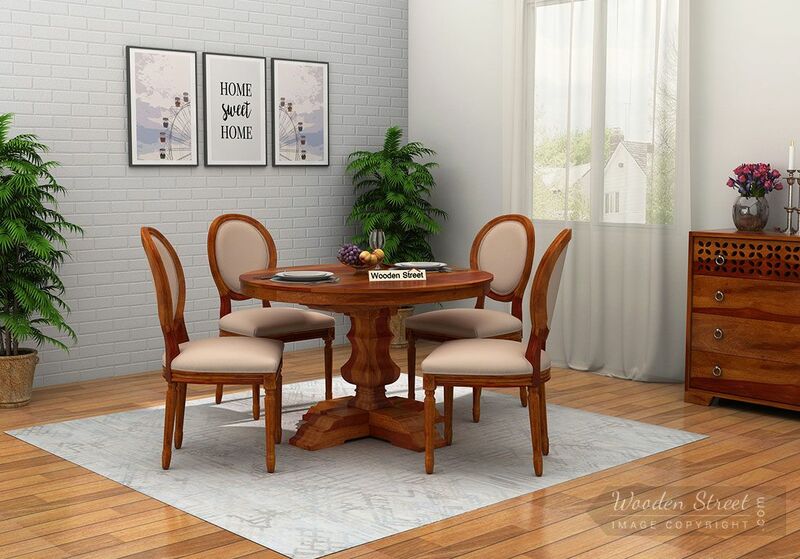 For a simple, rich appeal go for the wooden material round dining table set. The wooden material adds a sense of naturalness and glow to the room. Get rid of fancy ruffles and get the ‘simple yet elegant’ game on. 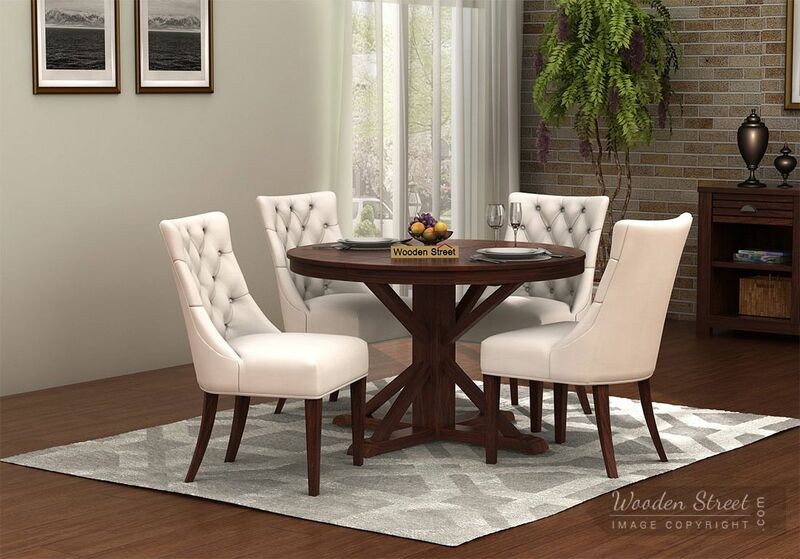 Give an edge to the smooth round dining table set by introducing some square or rectangular shaped plates and glasses. This will make the entire them look edgy and bold. Are you in the misconception that the guests don't pay attention to the items placed on the round dining table sets! Then, clear it out. Everyone observes and judge the decoration of each and everything. So, to fill the round dining table set with small entities that don't take up extra space but do make the table look outstandingly awesome. Get the fancy candle holders, scented candles, silver salt and pepper cellars and potpourri, these small things will make the traditional wooden round dining table set to look fabulous. You can go for fresh flower decoration, change flowers on daily basis. Flowers will add a splash of colours.